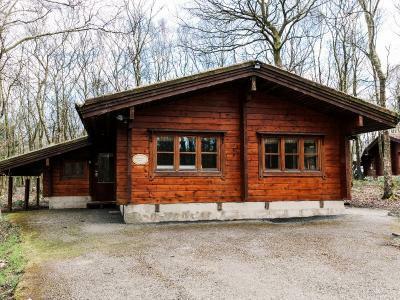 The woodland health club and spa at Chevin Country Park Hotel overlooks the lake, offering guests an outdoor hot tub, indoor pool, thermal suite, gymnasium and a range of spa treatments by Elemis. Enjoy a taste of Yorkshire at its best in the Lakeside Restaurant, where the region’s finest fare is cooked up to create delicious dishes. The restaurant features a mezzanine level and an outdoor deck area, overlooking the surrounding lake and woodland. Historic Otley is situated two miles from the hotel. Wander the cobbled streets of this Yorkshire market town and explore its thriving independent shops – designer clothing, artisan bread, ethical jewellery, patisserie and handmade chocolates, fine wine and a great deal more. Otley market has an 800 year history, bursting into life three times a week. Explore a little further and you’ll reach the landscapes of Nidderdale AONB and the magnificent Yorkshire Dales National Park. Needless to say, walking cycling, and other opportunities for outdoor pursuits – including climbing and bouldering – abound in this part of the world. Hire bicycles and ride the trails of the Chevin Forest Park, or follow sections of the Tour de Yorkshire. Vibrant Leeds, the spa town of Harrogate and the historic treasure trove of York are but a hop, skip and a jump away – 11 miles, 12 miles and 30 miles respectively. Welcome to Chevin Country Park Hotel & Spa – your Alpine-style retreat in Yorkshire’s majestic heartland. We say: A comfortable room with all the essentials. These rooms offer satellite TV/radio, work desk, direct dial phone, alarm clock, ironing station, tea and coffee making facilities. 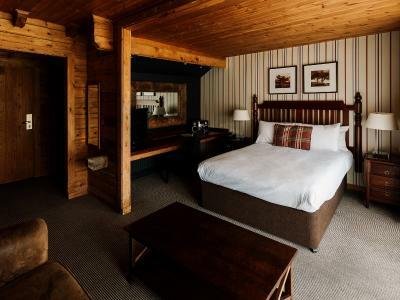 These rooms are located in a separate annex, a pleasant stroll from the main hotel building. Free Wi-Fi is available in the main hotel building. One double bed. We say: A comfortable room with all the essentials. These rooms offer satellite TV/radio, work desk, direct dial phone, alarm clock, ironing station, tea and coffee making facilities. 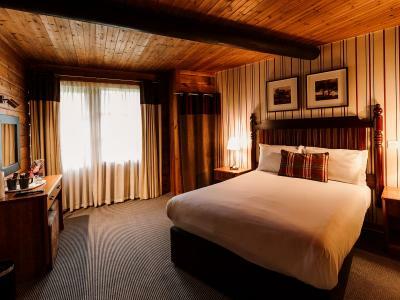 These rooms are located in a separate annex, a pleasant stroll from the main hotel building. Free Wi-Fi is available in the main hotel building. Two single beds. We say: Escape to a woodland glade. 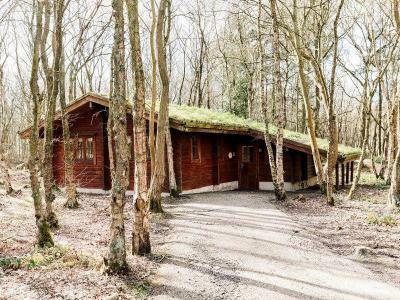 The turf-roofed woodland cabin rooms are set in the midst of the leafy hotel grounds, offering satellite TV/radio, work desk, direct dial phone, alarm clock, ironing station, tea and coffee making facilities. Free Wi-Fi is available in the main hotel building. Double bed. We say: traditional country house style bedrooms offering free Wi-Fi, satellite TV/radio, work desk, direct dial phone, alarm clock, ironing station, tea and coffee making facilities. Located in the main building. Double bed. We say: Escape to a woodland glade. 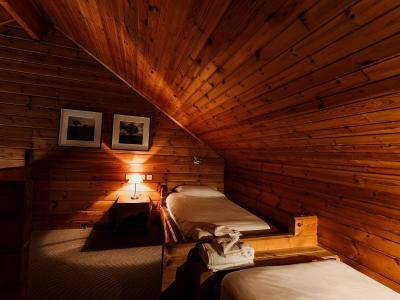 The turf-roofed woodland cabin rooms are spacious and bright, set in the midst of the leafy hotel grounds. These rooms offer satellite TV/radio, work desk, direct dial phone, alarm clock, ironing station, tea and coffee making facilities. Free Wi-Fi is available in the main hotel building. Double bed. 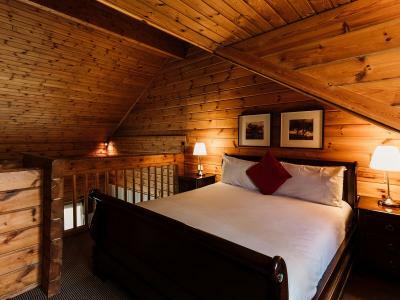 We say: Traditional, spacious country house style rooms with lake and woodland views. These rooms offer free Wi-Fi, stereo, satellite TV/radio, bathrobes, work desk, direct dial phone, alarm clock, ironing station, tea and coffee making facilities. Located in the main building. Double bed. 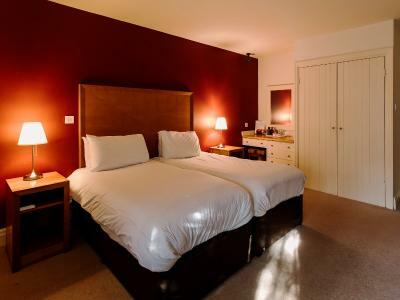 We say: Traditional, spacious country house style rooms with lake and woodland views. 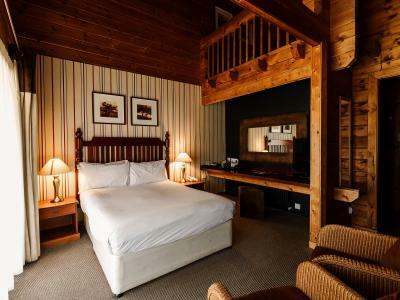 These rooms offer free Wi-Fi, stereo, satellite TV/radio, bathrobes, work desk, direct dial phone, alarm clock, ironing station, tea and coffee making facilities. Located in the main building. One double and two single beds. 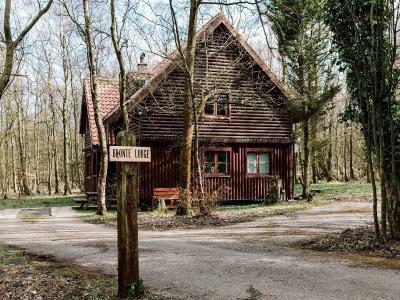 We say: Escape to a woodland glade. 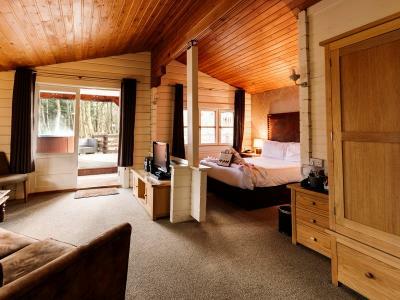 The turf-roofed woodland cabin rooms are spacious and bright, set in the midst of the leafy hotel grounds. Kick back and take in the woodland setting from your own private hot tub. These rooms also offer an open plan lounge area, satellite TV/radio, work desk, direct dial phone, alarm clock, ironing station, tea and coffee making facilities. Free Wi-Fi is available in the main hotel building. Double bed. We say: Escape to a woodland glade. 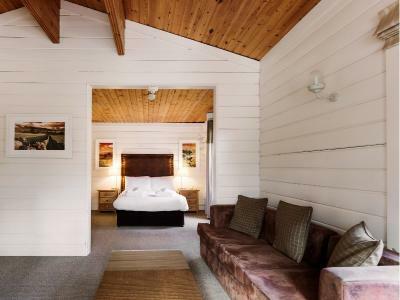 The turf-roofed woodland cabin rooms are spacious and bright, set in the midst of the leafy hotel grounds. They offer plenty of comfortable seating, two bedrooms with a double and two single beds, a compact kitchenette, satellite TV/radio, work desk, direct dial phone, alarm clock, ironing station, tea and coffee making facilities. Free Wi-Fi is available in the main hotel building. Two double beds. We say: Escape to a woodland glade. 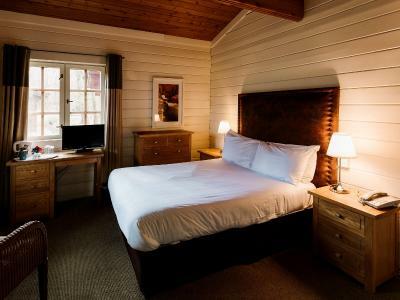 The turf-roofed woodland cabin rooms are spacious and bright, set in the midst of the leafy hotel grounds. 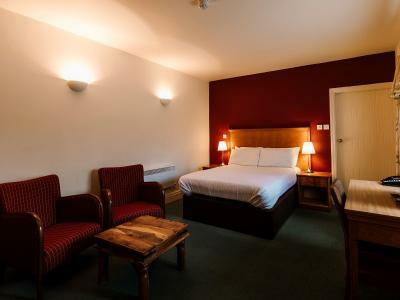 They offer plenty of comfortable seating, three bedrooms with a double room two rooms with two single beds, a compact kitchenette, satellite TV/radio, work desk, direct dial phone, alarm clock, ironing station, tea and coffee making facilities. Free Wi-Fi is available in the main hotel building. Two double beds. Exit the airport and follow the A658 (Harrogate Road) north, towards Harrogate. Take the first turning on the left – Otley Old Road. After approx. half a mile, turn left onto York Gate. Follow this road – the hotel entrance is on the left, after less than half a mile. Stay & Fly packages are available at the hotel, allowing you to leave your car at the hotel for 7 or 15 days, whilst travelling abroad. Follow the A660 out of Leeds. After the roundabout/junction with the A6120 (at Weetwood), take the next left onto Otley Old Road. After two miles this road becomes Cookridge Lane - continue to follow it. After a mile there is a sharp right bend; after this bend turn left back onto Otley Old Road. Follow for two miles then turn left onto York Gate. Follow this road – the hotel entrance is on the left, after less than half a mile. Tranquil lake and forest scenes may distract you momentarily, but in the Lakeside Restaurant the delicious food is the main event. Rural Yorkshire’s plentiful larder yields much of the produce used to create the daily changing six-course taster and a là carte menus. Yorkshire venison, beef and lamb, all from local suppliers. Fresh fish, sustainably sourced. Rhubarb from West Yorkshire’s ‘Rhubarb Triangle’ (awarded Protected Designation of Origin status in 2010). Glorious food, prepared with passion. And our desserts? They really are the stuff of legend. If you have a day’s exploring mapped out, treat yourself to a hearty full breakfast, cooked to order, or cinnamon French toast with maple syrup. Cold buffet options are also laid out for you to choose from. Take a seat. Gaze across the calm water. Savour every mouthwatering moment. Please reserve a table for dinner in advance. Vegetarian, vegan, gluten-free and dairy-free dietary requirements can be catered for. With so much walking, cycling and exploring to be done in the locality, you'll appreciate some time to unwind. The health club features a 11-metre indoor pool and thermal suite. Step out into the birch tree forest and take a soak in the lakeside hot tub. Two spa treatments rooms, including a couples suite, offer ELEMIS pampering treatments and both Shellac and Jessica nail treatments. Robes and slippers are provided and spa guests can take time out in a dedicated relaxation room. The air-conditioned gymnasium offers cardio vascular equipment, weight resistance machines, free weights, exercise balls and body conditioning programmes. It has wall-mounted TVs and qualified instructors are on hand for advice. A tennis court is available for guest use and rackets and balls can be provided. * Please note: the gym equipment and thermal treatments (hot tub; spa pool; sauna; and steam room) may not be used by anyone under the age of 16. A full range of spa treatments, using ELEMIS, Jessica and Shellac products, are available to book. We recommend booking at least 7 days in advance.